Ouvre dans 18 h 57 min. 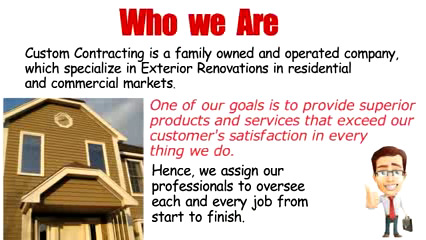 Custom Contracting Burlington Roofing & Siding is a premier roofing contractor in Burlington Ontario specializing in roofing and eaves trough cleaning and repair. In business for over 50 years, they proudly serve Burlington and the surrounding area with quality workmanship at affordable pricing. Soyez le premier à écrire un avis pour Custom Contracting!